Index Return to Textbooksfree.org/ Updated 2/919 Please link to and Share! because teachers manage rather than just lecture. Scored Poorly in Mathematics, Or Did They? "What Does a Typical Day Look Like? "Each day in San Jose, Calif., about 15,000 elementary students use a popular software program called Dreambox Learning. Math class starts with 20 minutes of whole-class instruction. Then students are split into small groups. For the next 40 minutes, they cycle between time with a teacher, time working collaboratively with peers, and independent work on Dreambox. Jessie Woolley-Wilson, the company's CEO, says that if schools are using her product, they're doing personalized learning. That's because the software is "intelligently adaptive"—it helps students who are behind catch up and lets students who are ahead move forward. If the software notices that a student is using an inefficient procedure to solve a particular problem, it might cut in with a targeted lesson son." Editor's Notes: Great for reading. 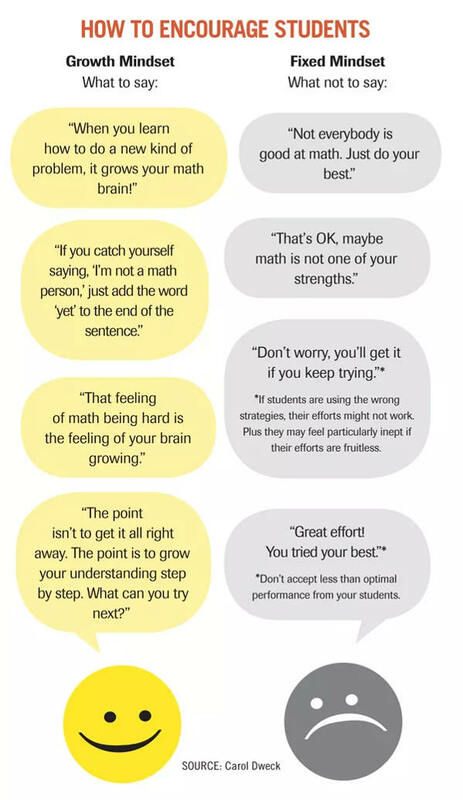 This will help the employment of better math students most. Gap between. Gap in career opportunities will widen. between top and bottom will widen. Key will be finding meaning career help for all students!
" But that's dramatically different from life inside the country's 65 Big Picture Learning high schools. There, personalization is about tapping into students' passions through real-world internships. Relationships are cultivated through small advisory groups that stick together for four years. Tests are replaced with "public displays of learning" tied to students' own interests." This will help students help improve their special intelligence? and most students have one maybe two at most. of managing a fair meritocratic system. i.e. that which they do well. 1. Improve HS Graduation Rate. .2. Maximize Use of Free Internet Learning Materials. 3. Charter Schools Using cost/benefits analysis. 5. Track Students by Ability. 6. Community or State Determines Curriculum Content. 7. A Student's Curriculum Based on What They Do Well. 8. Guided by Bloom's Taxonomy. 9. 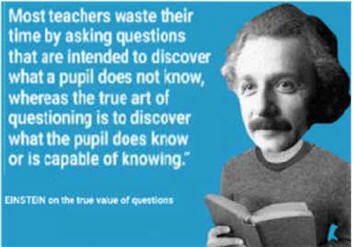 Choose between Pedagogy or Andragogy. In 1962, President John F. Kennedy Executive Order 10988 led to state laws permitting the unionization of public employees. In 1969, the U.S. Supreme Court, in Tinker v. Des Moines Independent Community School District, ruled that the Constitution forbids local schools from suspending students who bring political protest inside the schools. In his dissent, Justice Black wrote:, "I repeat that if the time has come when pupils of state-supported schools, kindergartens, grammar schools, or high schools, can defy and flout orders of school officials to keep their minds on their own schoolwork, it is the beginning of a new revolutionary era of permissiveness in this country fostered by the judiciary." We now have "The Language Police," education historian Diane Ravitch's meticulous but horrifying narrative of how the major textbook publishers, the testing companies and state education departments have reduced what public-school kids learn to politically correct, politically laughable pabulum and swill. In 1975 Goss v. Lopez, the Court ruled in the case of a suspended student, a hearing was required. In dissent Justice Powell wrote In 1975 Goss v. Lopez, the Court ruled in the case of a suspended student, a hearing was required. In dissent Justice Powell wrote "One who does not comprehend the meaning and necessity for discipline is handicapped not merely in his education but throughout his subsequent life." In the years since, courts and legislatures gave the neighborhood school yet another big legal obligation: Mainstream and educate severely disabled kids. 1. Should Education Studies Affect Curriculum? Schools, using a school-level randomized field experiment. state test scores and no effect on math state test scores. 92.0 percent) and 0.01 standard deviations per year on ELA scores. tutor characteristics at the schools they attend. students,  especially males and non-white students. use are also negative but generally less precisely estimated. as a policy tool to curb youth drinking. This paper estimates the effects of personality traits and IQ on lifetime earnings, both as a sum and individually by age. The payoffs to personality traits display a concave life-cycle pattern, with the largest effects between the ages of 40 and 60. The largest effects on earnings are found for Conscientiousness, Extraversion, and Agreeableness (negative). An interaction of traits with education reveals that personality matters most for highly educated men. The overall effect of Conscientiousness operates partly through education, which also has significant returns." Mike Bloomberg identifying and closed schools failing their kids. New Mmayor de Blasio took a collaborative approach to turn around 94 lowest-performing schools with substantial additional ­resources. More social services, administrative attention and collaboration were hallmarks of Renewal. Four years and $773 million later, a failed impact ended the program. Cognitive Nonroutine: managers, computer scientists, architects, artists, etc. Manual Nonroutine: food preparation, personal care, retail, etc. 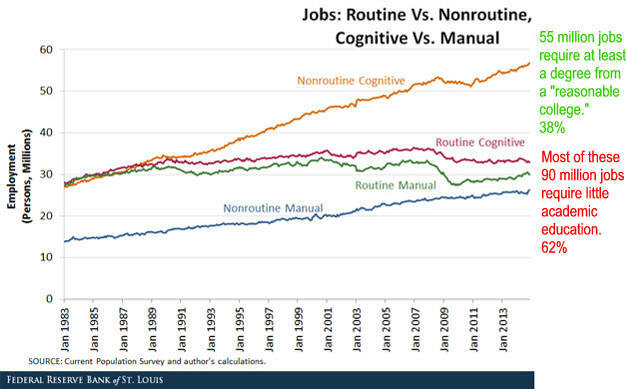 Cognitive Routine: office and administrative, sales, etc. Manual Routine: construction, manufacturing, production, etc. '...stark contrast between the skill requirements in the two occupational groups growing the fastest. 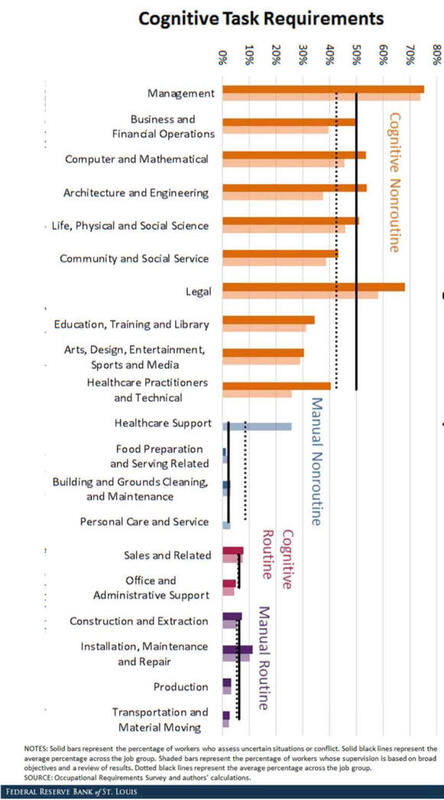 The cognitive nonroutine group requires complex decision-making, independent working conditions and less physical effort, while the manual nonroutine group still requires quite a bit of physical effort and does not involve a high level of cognitive tasks." Charter School Growth and Replication 1/30/13. "This is the most consistent finding across charter school evaluations. in general, and for their deterioration over time. 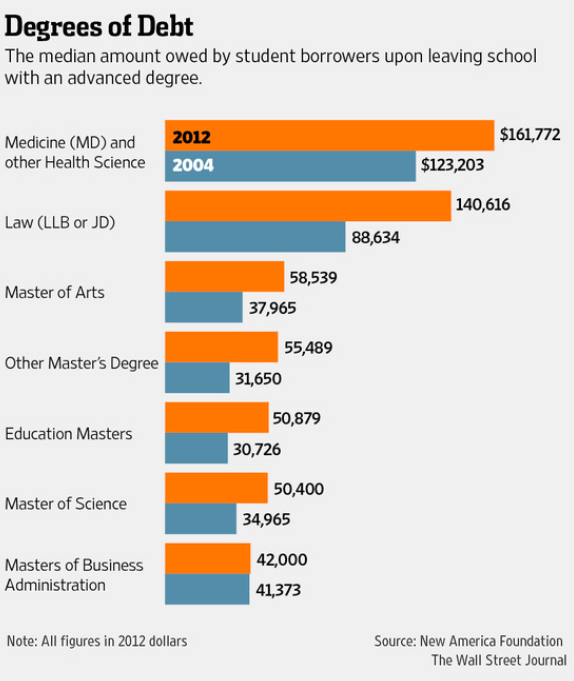 11.5 percent; for the 2009 cohort, it was 16.3 percent. (Treasury tabulations of NSLDS, Table 15). while demand has been growing, causing consumer prices to inflate more than wages have risen. Energy is nearly a third of transportation costs and a tenth of housing and agriculture. Public education controls 92 percent of K-12 and 78 percent of higher education. 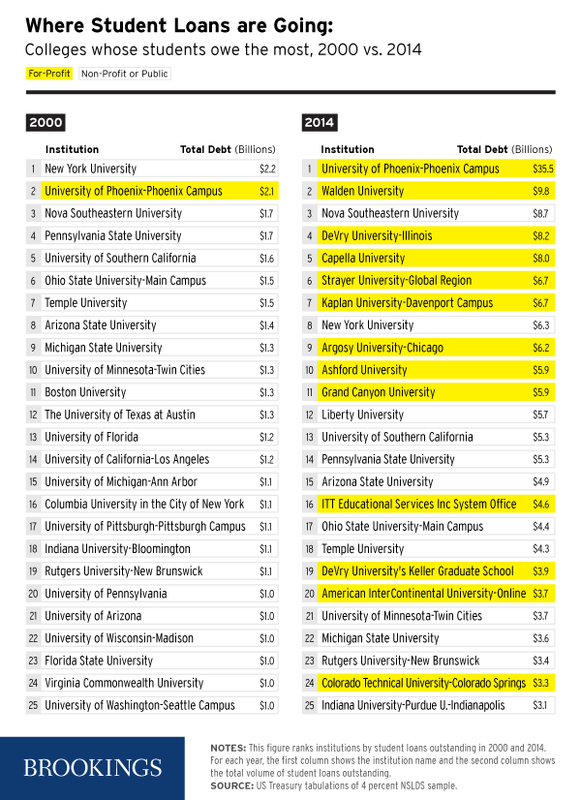 Colleges preferential government funding covered the majority of revenues. Government increased demand and prices all areas of medicine with the passage of Medicare and Medicaid. Poor kids pay little for a great educational opportunity. I really do not agree with the author that paying full price lowers the incentive of upper middle class workers to earn the necessary money to do what is best for their kids. 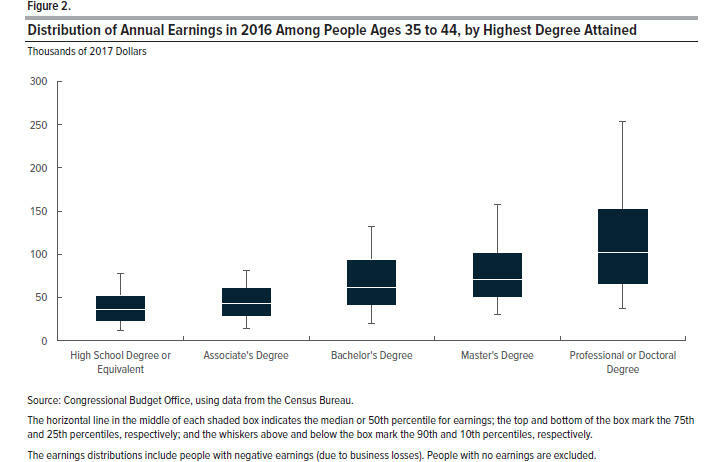 If anything, Tiger Moms have increased since the better college started over charging those at the top to maximize revenue to, among other things, bring in the best and brightest of those from lower income families. It concerns me that the parents are in effect, sponsoring the competition their kids will face for the fewer and fewer good jobs. 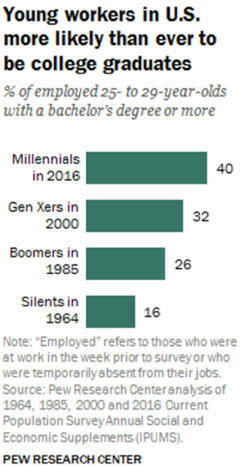 Of course in the good old days money brought the degree and the good job! Parents and politicians foster a very negative educational atmosphere by requiring a highly academic education for most students when many students have a nonacademic special intelligence. 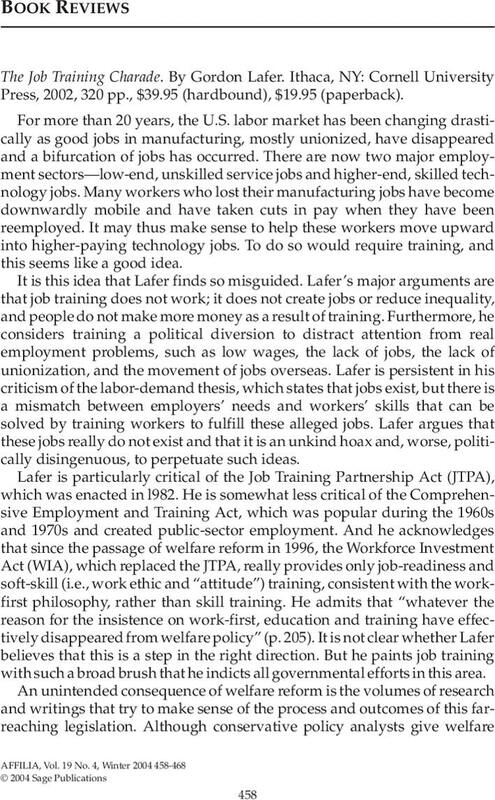 Teaching is also more difficult because fewer and fewer good U.S. jobs exist in our very competitive “Flat World.” [http://www.textbooksfree.org/World%20Changed%20and%20Good%20Jobs%20Disappeared.htm]. [http://www.textbooksfree.org/Individualized%20Curriculum.htm] where teachers manage rather than lecture. Apprenticeship programs are more prevalent and successful in other countries than in America. In the United Kingdom, the apprenticeship system was nearly nonexistent about two decades ago. However, since 1997 the UK has increased apprenticeship starts almost fourfold, from approximately 75,000 apprenticeship starts to a little over 290,000 starts during the 2015-2016 term. The UK has also changed the composition of apprenticeships. Apprenticeships used to be designed around blue-collar jobs such as construction or manufacturing. 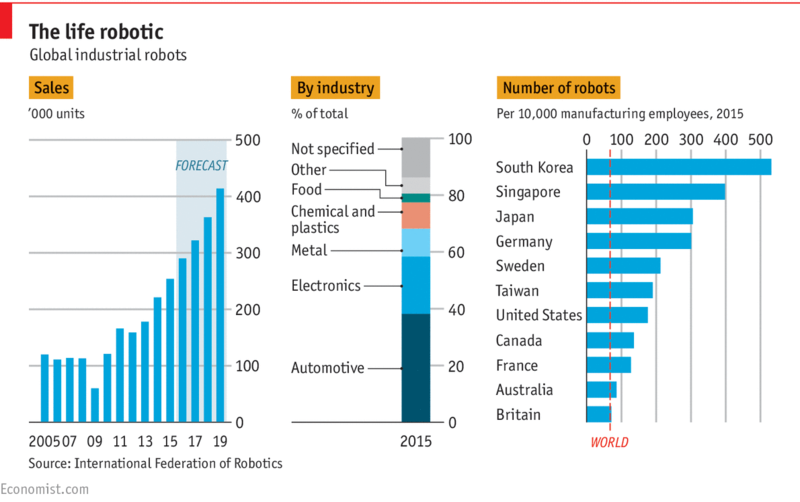 More recently, the UK has been encouraging the growth of apprenticeships from intermediate- level apprenticeships to advanced- and higher-level apprenticeships in “non-traditional” industries, such as information technology or management. Funding for the apprenticeship programs in England are now paid for through an “Apprenticeship Levy” that is raised on employers. Companies with an annual payroll over approximately $4 million must pay 0.5% of the payroll bill, but they then receive this levy in the form of an annual allowance for apprenticeships. Unused funds do not carry over to the next tax year. For companies paying less than $4 million in payroll, the costs of the programs are split with the government. Apprenticeships in the United States are often thought as a Plan B to college, but they do not have to be. High schools do not advertise apprenticeships as viable alternatives to college. 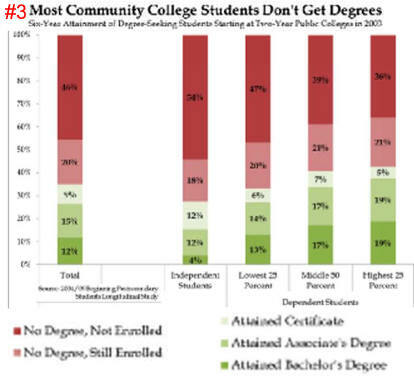 This is often because states base their high school ratings on the number of graduates that go to college afterwards. If ranking systems were changed, high schools would likely be more willing to promote other paths into the workforce. Discovering the proper formula for expanding apprenticeship programs in the United States will take time and experimentation to perfect. Fortunately, the United States benefits from being able to learn from trials in different states. The goal of reaching 5 million apprenticeships in the United States is lofty, but as the South Carolina example suggests, some employers and employees are ready to embrace the apprenticeship pathway. Apprenticeship programs in South Carolina have been particularly effective. Brad Neese, Associate Vice President and Director at Apprenticeship Carolina, and his company have found great success connecting youths to registered apprenticeship programs in the state. In the past decade, the South Carolinian apprenticeship programs have grown substantially. Neese said that when he began working for Apprenticeship Carolina he only hoped to get four companies to join that year. Instead, he got four companies in one day. Since 2007, South Carolina has increased the number of apprenticeship programs from 90 to 918 and the number of active apprentices from 777 to 14,475. The extensive growth illustrates that a demand exists from both employers and employees for apprenticeship programs. The South Carolina experience could be an example to other states. Neese believes South Carolina’s success can extend to all of the country through state-specific programs and federal tax credits. Because all states have different economic conditions in terms of popular industries, labor force participation, etc., Neese does not believe that a uniform apprenticeship program will match the needs of individual states. Will we accept that CTE often entails "voucher schools"?? Will we accept that expanding CTE may eliminate some existing teaching positions? Will we accept that traditional teacher preparation is inadequate or unnecessary for CTE instructors? 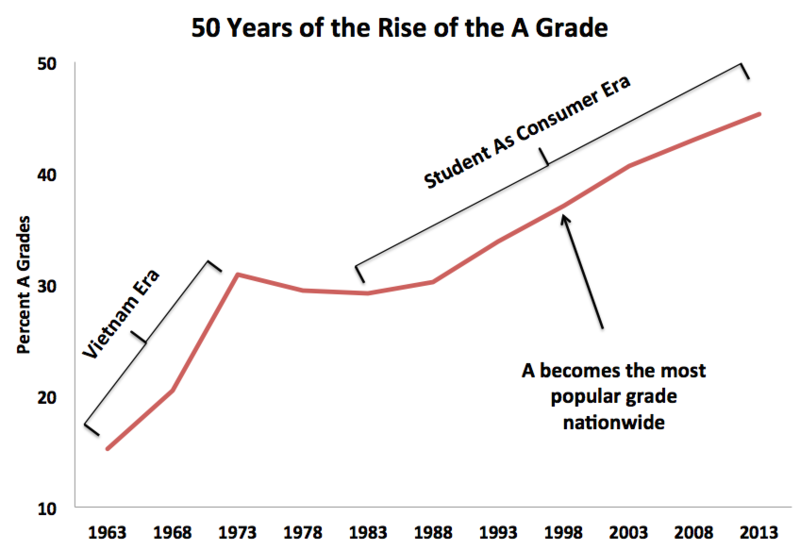 Will we accept CTE's bedrock reliance on high-stakes testing? "Johnson: So essentially what you're making the case for is education and job training for grown ups. Cuban: No, no. 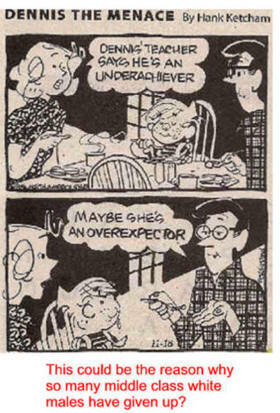 I think that won't matter. What are you going to go back and learn to do? Johnson: What it takes, right? Whether it's finance, whether it's software programming. Cuban: No finance. That's the easiest thing — you just take the data have it spit out whatever you need. Cuban's forecast of the skills needed to succeed in the future echoes that of computer science and higher education experts who believe people with "soft skills," like adaptability and communication, will have the advantage in an automated workforce. Cuban highlighted English, philosophy, and foreign language majors as just some of the majors that will do well in the future job market. " Mark Blyth on Encouraging Technology. 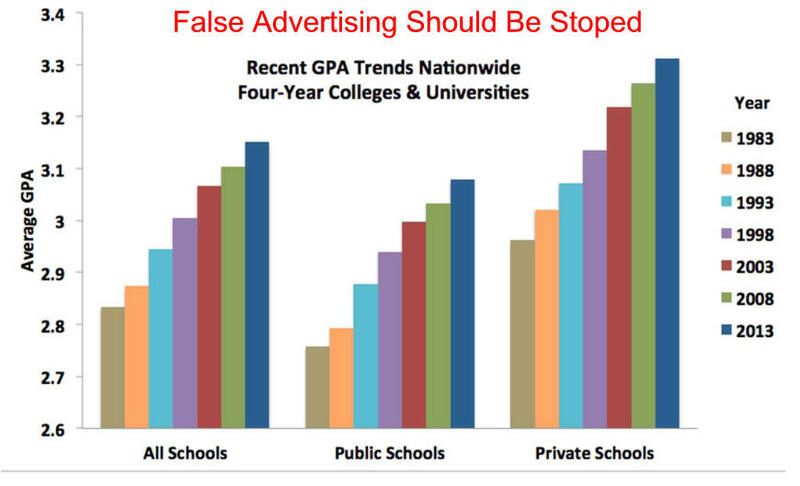 "The President [Obama] has introduced programs that try to reward schools that don't raise tuition and costs." Mark Cuban feels this will not work. "Right now there is a never ending supply of buyers." 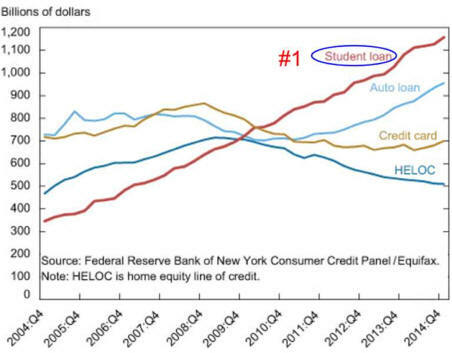 who borrow heavily and then cannot flip "there college loans for that“ great job you are going to get when you graduate." Mark believes "BRANDED schools are popping up that will offer better educations for far, far less and create better job opportunities." 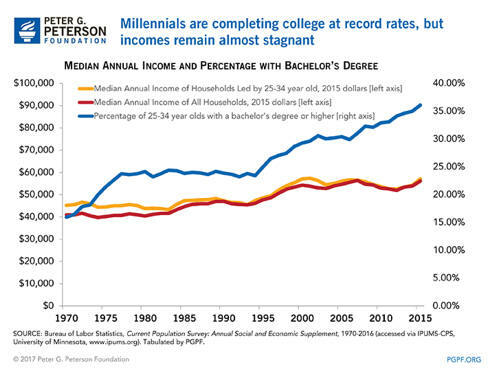 "Its just a matter of time until we see the same meltdown [as in housing] in traditional college education." "I include the Online For Profit Mills that live off of the government delivering student loans as part of traditional education." 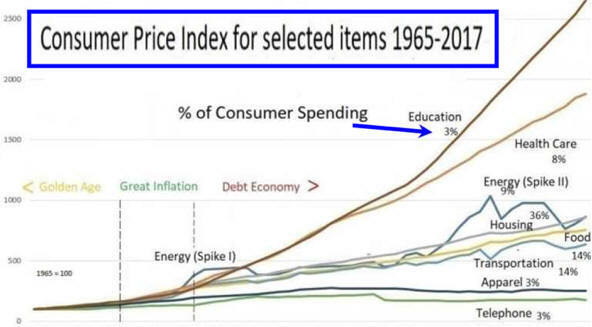 "So until we get the meltdown in college education, don't expect much improvement in the economy. Who gets elected won't make a dang bit of difference." said college is a good investment choice. "Steve Jobs finished high school with a 2.65 G.P.A." "J.K. Rowling graduated from the University of Exeter with roughly a C average." "Rev. Dr. Martin Luther King Jr. got only one A in his four years at Morehouse."